Tardigrades. What in the world is a tardigrade? I had to look it up. 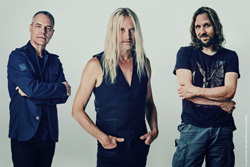 But perhaps it's better for Nick Beggs, The Mute Gods founder, composer, and multi-instrumentalist, to explain both the animal and the title track to the new album, Tardigrades Will Inherit The Earth "It refers to a water-dwelling, eight-legged micro-animal capable of living in extreme conditions. They've been found living on the outside of the international space station and inside nuclear reactors. If humanity continues down the path of extinction, they may well be the next dominant species." Well, that's one thing about prog artists: they like to let you know how smart or odd they can be. Or both. Beggs returns with fellow Mute Gods, Roger King (Steve Hackett) on keys, guitars, and production, and Marco Minnemann (Joe Satriani, Aristocrats) on drums and guitars. Both musically and lyrically, this album is a continuation of themes found within Do Nothing Till You Hear From Me. To the latter, Beggs explores societal, scientific, and political ills with an "examination of societal control mechanisms, and looks at the inevitable outcomes should we continue down dark, dogmatic pathways." He's not very optimistic, either about our current times or possible future choices and direction. Beggs seems nearly fatalist: pretty much the "we're totally screwed" variety. You can read a track by track description of the songs. Note his observations about the songs Saltatio Mortis, Lament, We Can't Carry On, Early Warning, or the aforementioned title track. We're doomed. Musically, Tardigrades Will Inherit The Earth sounds much like the previous album as well. It's airy, ethereal, yet heavier at times. It's also diverse in tones and momentum, and strong in melody and harmony. Additionally the songs are versatile, vigorous, and engaging in instrumentation, especially the intertwining of wistful synths with bass, Stick, and guitars. Fundamentally, The Mute Gods deliver some creative progressive music. Yet this time around it seems that the songs were crafted first with melody and harmony, rhythm and groove, to draw the listener in, and then wow you with creative and complex prog wizardry. It didn't work for me on songs like Early Warning and Stranger Than Fiction, which I found to be dull. But songs like We Can't Carry On and The Dumbing of the Stupid are both inspired prog and great rock songs, thanks to the instrumental wizardry. In the end, Tardigrades Will Inherit The Earth finds The Mute Gods establishing a coherent and passionate progressive music pattern which most genre fans will find enjoyable. Recommended. 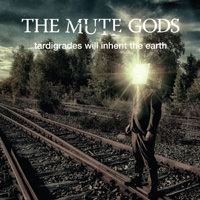 Tardigrades Will Inherit The Earth finds The Mute Gods establishing a coherent and passionate progressive music pattern which most genre fans will find enjoyable. Recommended.